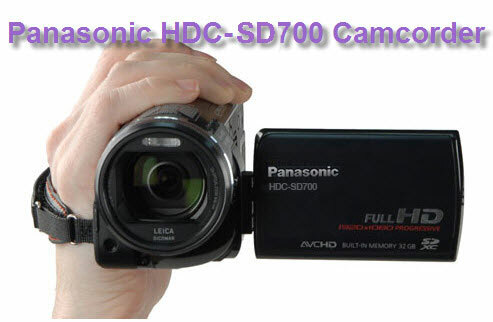 The Panasonic HDC-SD700 is a Full HD camcorder that records AVCHD video to removable flash memory cards. The SD700's high-sensitivity 3MOS system has achieved 11.49 million effective motion image pixels (3.83 megapixels x 3). This new image sensor offers beautiful images with significantly better colour quality, detail and gradation than the 1MOS sensor system. New 1080/60p 1080/50p recording (Full-HD, 1920 x 1080, 60/50 progressive recording) produces the ultimate beauty in image quality, exceeding even conventional Full-HD images. With it, the biggest good news is that the SD700 can shoot 1080/60P. The bad news is that it is nearly impossible to currently edit this format directly. With SD700 1080/60p, 1080/50p footages, there are many incompatibility issues happened on Mac when you tried to open them, play them, edit them, transcode them, etc. 1. Panasonic SD700 recording in 1080/50p (PAL) - how do I get onto a MAC? 2. The newest Panasonic camcorder, the SD700 records video at 1080/60p in an MPEG-4 format, I found the clips can not easily import to iMovie 9 for editing, please help? The 1080/60p, 1080/50p data in Panasonic HDC-SD700 can be opened/edited on a PC using the included HD Writer AE 2.0 editing software (for Windows OS only), which allows easy editing of recorded MTS footages on PC and uploading of video clips to the YouTube website. However, if you are a Mac user and shoot one-day movie with the HDC-SD700's native 1080/60p 1080/50P setting, proprietary MPEG-4 codec, you will find that there isn't anything on your Mac really compatible with it. The AVCHD 1080p60 mode with the bitrate (28Mbps) is higher than the AVCHD spec allows (17 Mbps for main profile, 24Mbps for high profile). All Apple's software is strictly holding to the spec. So it is normal that you can not open, play even edit your SD700 1080/60p, 1080/50p Files on Mac except Apple adds the support for it in their apps. But now, Aunsoft listened to the voice of SD700 users, developed MTS/M2TS Converter for Mac as the first and best Mac SD700 1080/60p Player/Converter/Editor before Apple’s support for 60p. With it, you can preview HDC-SD700 60p/50p footages with inserted player, convert 1080/60p MTS files to 1080/24p, 1080/17p MOV, AVI, MP4, WMV, DV, etc format for iMovie, Final Cut Pro, FCE, Avid, Adobe Premiere Pro, PS3, QuickTime, iTunes, iPad, iPhone 4, LCD Projector, etc, and edit 1080/60p, 1080/50p clips by deinterlacing, merging, splitting, rotating, applying effect and so on. From now on, you will never worry about the incompatibility of SD700 60p with your Mac OS X 10.4 Tiger, Mac OS X 10.5 Leopard, Mac OS X 10.6 Snow Leopard on iMac, MacBook, Mac Pro, Mac Mini, etc. If you are using Windows OS like Windows XP, Windows Vista and Windows 7, you can try SD700 1080/60p Player/Converter/Editor for easier editing on Adobe Premiere, Avid Media Composer with 5.1 channel audio and high definition. If you want to know more information, please enter Aunsoft Panasonic Camcorder Column.